Hometown: Essex, New Jersey, U.S.
Died: October 1, 2003 in Operation Iraqi Freedom. Unit: Army, 1st Battalion, 13th Armored Regiment, 3rd Brigade Combat Team, 1st Armored Division, Fort Riley, Kan.
Army Specialist. 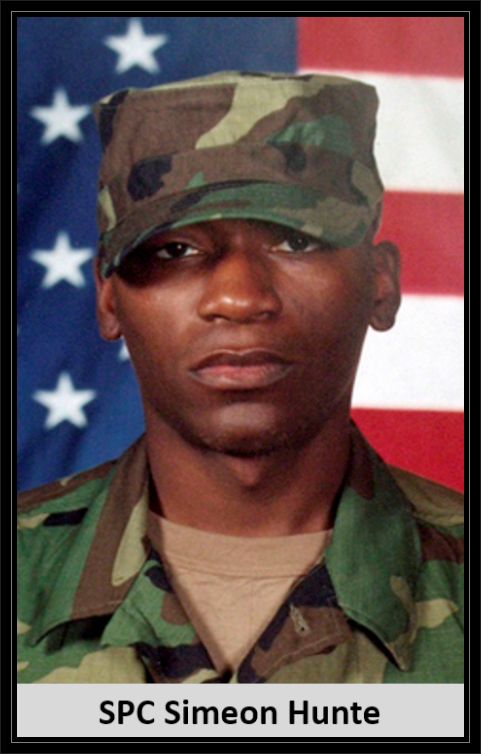 Killed in combat operations. College student at Montclair State University in Montclair, New Jersey. Simeon dreamed of one day becoming a doctor and joined the United States Army in 2001 to finance his graduation. He was assigned to the 1st Armored Division while patrolling Al Khadra, an Iraqi civilian approached him and shot him with a pistol. He was a husband and father. 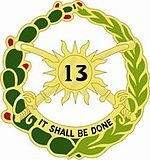 Army Spc. Simeon Hunte, five months in Iraq, was wearing down. Friends had been injured and killed in guerrilla attacks, he wrote. The country's withering heat sapped energy and morale. Most importantly, the letter said, he missed his wife and daughter and the newborn son, Simeon Jr., he hadn't yet seen. "He was getting depressed," Shirley Vigilance, Hunte's grandmother, said yesterday. "He said he didn't know how much more he could take. He wanted to come home so badly. "And now he's coming home in a body bag." Hunte, 23, a Newark native assigned to the 1st Armored Division, was shot in the face and killed Wednesday as he patrolled in Al Khadra, a suburb of Baghdad. The military has released few details about the incident, in which an Iraqi civilian approached Hunte, raised a pistol and opened fire. It was not immediately known if the shooter was caught or killed. The details don't do much to ease the pain, anyway, the man's grandmother said. The letter, written to Hunte's wife but shared with Vigilance, offers even less comfort. "It hurts more than I ever knew I could hurt," Vigilance, 70, said in her Irvington home, the walls lined with photos of Hunte and other relatives. "He was really going through hell over there." Hunte tried to put the best face on his situation. He called Vigilance and her husband, Andrew, a half dozen times from Iraq, his message always the same. "He told us not to worry," said Andrew Vigilance, 62. "I'd keep warning him, 'Take care of yourself. Watch your back. You don't know who you can trust.' And that was true. They shot him in the face. He never even had a chance." If there is bitterness, there is pride, too. "He was a young guy so full of life and courage," Shirley Vigilance said. "He knew he had a job to do, and he was doing it." A tank driver with the 1st Battalion, 13th Armored Regiment, 3rd Brigade Combat Team out of Fort Riley, Kansas, Hunte was mostly walking patrols in Iraq, his grandparents said. Through frequent letters and phone calls, Hunte kept in touch with his grandparents, his mother, Brenda, in Newark and his wife, Tara. The couple's daughter, Anaya, is 1 1/2. Hunte was especially looking forward to seeing his son and, eventually, teaching him how to be a man. "He couldn't wait to get home to that boy," Shirley Vigilance said. Brenda Hunte was not at home and could not be reached yesterday. Tara Hunte, who has been living with her family in South Jersey since her husband deployed from Fort Riley in April, also could not be reached. Shirley and Andrew Vigilance said their grandson grew up on South 14th Street in Newark, graduated from public high school and attended Montclair State University, though he did not graduate. He joined the army in 2001, hopeful the service could help him earn enough financial assistance to fund his ultimate goal. "Since he was this high," Shirley Vigilance said, holding her hand at her waist, "he always wanted to be a doctor. He said it didn't matter how many years it took him." On South 14th Street, neighbors recalled Hunte as an intelligent, polite teen, one of three siblings. Hunte has an older sister and an 11-year-old brother, Danny, who spoke with neighbor Catherine Bell after a military chaplain delivered the news of Hunte's death. "He told me to pray for him and his brother," Bell said yesterday, shaking her head at the memory. "I surely did." Shirley Vigilance said her grandson loved art, pointing to one of her most prized possessions, a large decoupage work Hunte completed in high school. It depicts Jesus before a golden sun, the hand of God reaching out for him from billowy clouds. Composed of thousands of slivers of paper, the work took weeks to complete. Once deployed, Hunte befriended an Iraqi artist, with whom he had discussions about art and techniques, the grandparents said. That friendship helped him keep an objective outlook, refusing to blame the Iraqi people when fellow soldiers were wounded or killed by insurgents. Guerrillas have lodged about a dozen attacks on U.S. troops each day since May 1, when President Bush declared an end to major combat operations. In that time, at least 179 soldiers have died in Iraq, according to Defense Department figures updated Friday. "He told us the hardest thing for him over there was to see one of his friends dying or getting injured," Shirley Vigilance said. 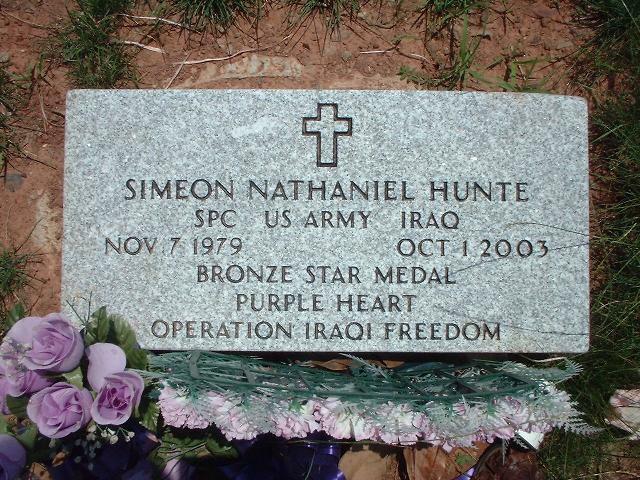 Today, she said, Hunte's unit in Iraq will hold a memorial service for him. A second service will be held at Fort Riley on Thursday. Funeral arrangements were incomplete yesterday. Scanning from photo to photo - Hunte in his high school graduation cap and gown, in his sharp dress blues, in camouflage atop a tank - the grandmother fought back tears, images rushing through her head. "He made me feel young," she said. "He would hug me and tell me he loved me and make me feel happy."